We thank you deeply for sharing this adventure with us, without you none of this would have been possible. Start by watching some of the latest talks, then read some recent posts to discover more about TEDxMontreal. Want to get our announcements directly in your inbox? Et si vous connaissiez les émotions de vos utilisateurs? Décisions anti-constitutionnelles dans une démocratie? Transmedia Reading : Let's read with all 5 senses! 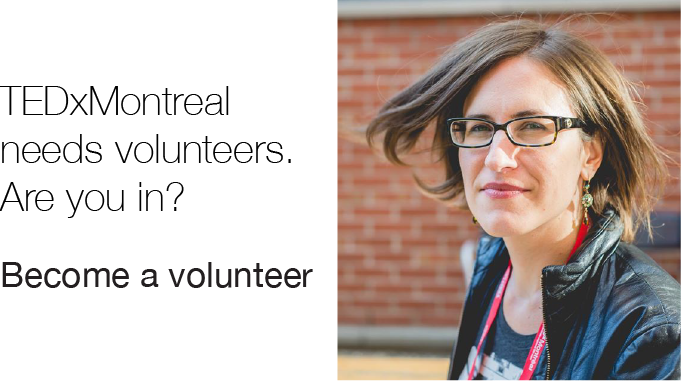 How do I become a speaker for TEDxMontreal? The exciting journey of becoming a speaker for TEDxMontréal begins with an Idea. If you believe your idea is worth sharing with us, your city, and the world, then thoroughly fill out the idea proposal form. A committee dedicated to the programming of the event will review the applications sent via this form and will establish a list of the most interesting suggestions. The candidates on that list are then interviewed in order to learn more about their idea. Once their ideas have been more deeply explored, a second selection committee – this time consisting of professionals from a variety of fields – examines the applications. 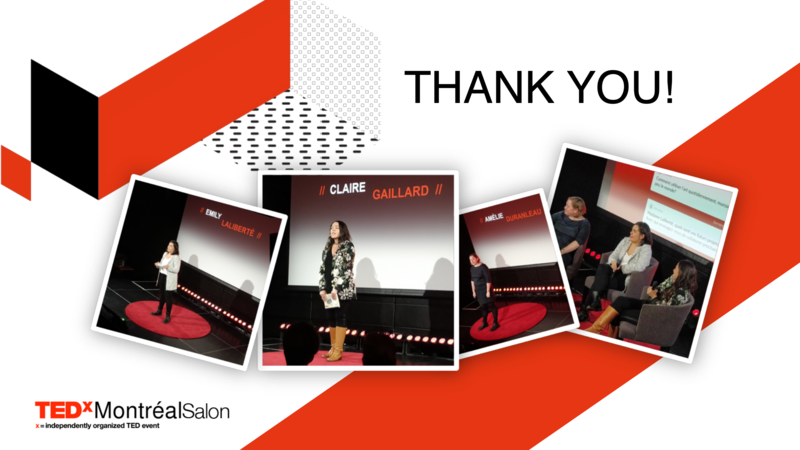 The programming committee presents each application to the selection committee and the latter eventually votes to choose the speakers that will be part of the next TEDxMontréal edition. Speakers are then coached all year long in order to prepare their talk, not only to make it a success on the day of the event but also to make it even more likely to be shared online in the TED community after the event. How do I stay informed about upcoming events? To stay up to date with the latest and greatest, subscribe to our newsletter. This way you will receive an e-mail as soon as a new event comes up and you won’t miss a beat ! Also, make sure to follow us on Facebook and Twitter to stay in our social media loop! For any other inquiries, please contact us with the form below. TED’s media initiatives include TED.com, where new TEDTalks are posted daily, and the Open Translation Project, which provides subtitles and interactive transcripts as well as the ability for any TEDTalk to be translated by volunteers worldwide. TED has established the annual TED Prize, where exceptional individuals with a wish to change the world are given the opportunity to put their wishes into action; TEDx, which offers individuals or groups a way to organize local, independent TED-like events around the world; and the TEDFellows program, helping world-changing innovators from around the globe to become part of the TED community and, with its help, amplify the impact of their remarkable projects and activities. In the spirit of ideas worth spreading, TEDx is a program of local, self-organized events that bring people together to share a TED-like experience. At a TEDx event, TEDTalks video and live speakers combine to spark deep discussion and connection in a small group. These local, self-organized events are branded TEDx, where x = independently organized TED event. The TED Conference provides general guidance for the TEDx program, but individual TEDx events are self-organized. For more information, visit ted.com/tedx. TEDxMontreal is a vibrant and stimulating platform for ideas to clash and connect in unexpected ways. On this day, a dozen speakers are given 18 minutes to present the talk of their life. From scientists to engineers, to artists and entrepreneurs, speakers from an array of fields share their perspectives and ideas. TEDxMontreal is much more than a one ­time event. With the talks published online for free, TEDx talks have triggered innovation in all corners of the globe. More than anything, TEDxMontreal aims at sparking genuine curiosity and initiating a love of learning in its most fundamental way. The TED movement has a vibrant presence in Montreal. We catalyze our city’s vitality into an immersive, face-­to-­face, day ­long bilingual experience.